Albert Theuwissen continues to post his reports from ISSCC. Shizuoka University presents a 200 million fps compressive imager. The imager consists of 15 pixel sub-arrays, each of them exposed at the differing times. In the end, a 200Mfps image sequence is recovered. PR Newswire: Remember Cista, a mysterious image sensor startup founded by ex-Omnivision employees? SMIC and Cista System Corp. jointly announce a mass production start of two CIS-BSI products, of 1.3MP resolution with 1.75um pixel and 8MP resolution with 1.4um pixel, respectively. Both sensors are based on SMIC's 0.13um BSI process. SMIC's 0.13um CIS-BSI technology is said to be independently developed and offers competitive performance. Based on a low leakage process, it only uses three aluminum metal layers for reduced cost and supports pixel sizes down to 1.4um for 8MP resolution CIS. SMIC also provides full in-house turn-key service which includes CIS wafer fabrication, color filter & micro-lens processing, TSV-CSP and testing to help customers shorten the supply chain with fast cycle time and low cost. "Through working with our partner, Cista System Corp., we are very pleased with the achievement of the production phase for BSI technology," said Dr. Shiuh-Wuu Lee, EVP of Technology Development of SMIC. "Tests on the two sensors have shown great performance which demonstrates our readiness in 0.13-micron BSI technology platform. SMIC is also developing 1.1-micron pixel BSI for 13MP resolution and above, and 3D stacked BSI for high-end applications. With these new sets of products, we hope to provide high-quality CMOS Image Sensors to our customers at a competitive price." "We are excited to partner with SMIC on launching the CIS-BSI sensors," said Wilson Du, CEO and President of Cista System Corp. "This partnership draws us one step closer to our goal of becoming more integrated with domestic industry resources in developing the image sensor sector. As we move forward, we hope to see more of our designs used in wider applications such as consumer electronics, telecommunications, medical equipment, automotive industry, automation and other applications." 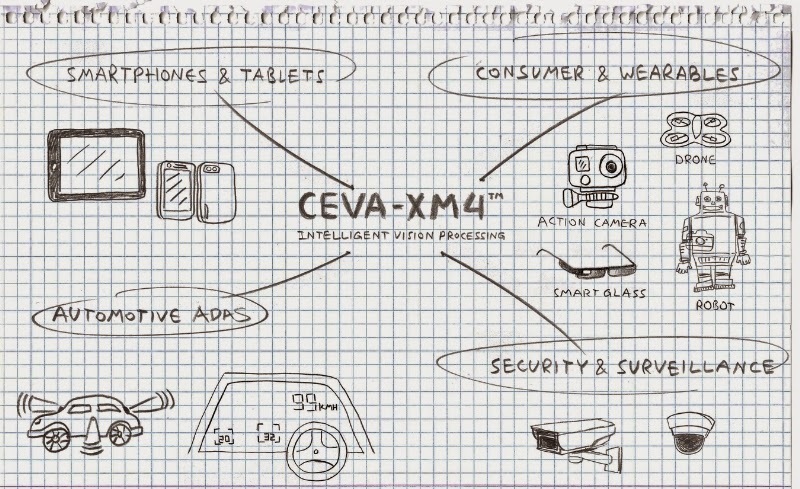 PR Newswire: CEVA unveils the CEVA-XM4, its fourth-generation imaging and vision processor IP. CEVA-XM4 achieves up to 8x performance improvement with 35% greater energy efficiency, compared to the previous generation CEVA-MM3101. The new IP's capabilities include real-time 3D depth map generation and point cloud processing for 3D scanning. In addition, it can analyze scene information using the most processing-intensive object detection and recognition algorithms, ranging from ORB, Haar, and LBP, all the way to deep learning algorithms that use neural network technologies such as convolutional neural networks (CNN). The architecture also features a number of unique mechanisms, such as parallel random memory access and a patented two-dimension data processing scheme. These enable 4096-bit processing -- in a single cycle -- while keeping the memory bandwidth under 512bits for optimum energy efficiency. In comparison to today's most advanced GPU cluster (points to NVIDIA, I guess), a single CEVA-XM4 core will complete a typical 'object detection and tracking' use-case scenario while consuming approximately 10% of the power and requiring approximately 5% of the die area. Taking computer vision one step closer to human vision, the CEVA-XM4 also supports a wide range of computational photography algorithms that enhance the video or image, including refocus, background replacement, zoom, super-resolution, image stabilization, noise reduction and improved low-light capabilities. PR Newswire: OmniVision reports results for its fiscal quarter ended on January 31, 2015. Revenues for the quarter were $292.3M, as compared to $394.0M in the previous quarter, and $352.0M a year ago. GAAP net income in the quarter was $14.0M, as compared to net income of $28.0M in the previous quarter, and $30.6M a year ago. GAAP gross margin for the quarter was 22.1%, as compared to 22.0% for the previous quarter and 19.6% a year ago. The Company ended the period with cash, cash equivalents and short-term investments totaling $512.8M, a sequential decrease of $12.4M that resulted primarily from the use of cash in operating activities. Based on current trends, the Company forecasts revenues for the next quarter in the range of $265M to $295M. "As we continue to expand in Asia and find new opportunities in emerging economies, our results may continue to be volatile, at least in the near-term," said Shaw Hong, CEO of OmniVision. "However, it is important for us to participate in these markets as they are integral to our strategy. We remain confident about our long-term growth prospects." SeekingAlpha publishes Omnivision's earnings call transcript. Shaw Hong says on the acquisition prgress: "I would like to comment on the proposed acquisition from Hua Capital Management Ltd., or HCM, a Beijing-based investment management company. A few months ago, we received a preliminary non-binding proposal letter from HCM, pursuant to which a group of investors led by HCM proposed us to acquire all of the outstanding share of common stock of the company in cash at US$29 per share. While the company's board of directors is reviewing and evaluating HCM's proposal, no decision has been made with respect to the proposed transaction. There is no assurance that this or any other transaction will be consummated." "In a special case, an innovative dual sensor main camera design featuring our 8-megapixel product line was launched by a major Tier 1 China customer. This represents a major potential technology shift where dual camera designs are built for a multitude of reasons such as improved sensitivity, slim compact design requirements and innovative 3D data capture. If this trend spreads, the total available opportunity in the already enormous handset market could surge to higher volumes because dual camera designs could be used for the main camera as well as for the front-facing camera slot. The benefits of a dual camera design are applicable to either case." "In our third fiscal quarter, we shipped 198 million units as compared to 246 million units in our prior quarter. The average selling price in our fiscal third quarter was $1.46 as compared to $1.60 in our prior quarter. The drop in ASP was attributed to the product mix and aggressive price erosion in some product categories, primarily products shipped to the China market. Unit sales of 8-megapixel and above represented approximately 10% of total shipments in the fiscal third quarter, compared to approximately 12% of total shipments in the prior quarter. Unit sales of 3-megapixel to 5-megapixel category represented approximately 41% of total shipments, as compared to 42% in the prior quarter for the same category. Unit sales of 2-megapixel and below represented approximately 49% of total shipments, as compared to 46% in the prior quarter." Embedded Vision Alliance posted a TI Youtube demo of its structured light reference design platform, first announced half a year ago. Framos 2014 survey on machine vision market paints an interesting picture. "The study is based on answers from 54 respondents based in 13 countries, 10 manufacturers and 44 users, with the main focus on German-speaking countries and Europe. Respondents were ranked in terms of relevance, based on the production or purchase volumes on which they were surveyed. 40% of the manufacturers produce up to 500 cameras a year, 20% over 10,000 cameras. Principal sales areas are North America and Asia. 80% of users purchase fewer than 100 cameras a year, only 5% require more than 1000 cameras. The main area of use is Europe, at 75%, due to the focus of this survey." "In respect of sensor brands and their future use in imaging systems, camera manufacturers and users are agreed on their decline or rise. Sensors from Sony may have less usage in percentage, but continue to be the most trusted brand, with a predicted market share of 35% in 2016. In particular, considerable growth is expected for the brands Aptina and Truesense Imaging (both now under one roof, belonging to OnSemi), to a market share of 13% and 19% respectively." AlliedSens becomes an official representative of Caeleste for custom design CMOS image sensor in Asia and America. AlliedSens also represents CMOSIS, PixelPlus and Awaiba. Albert Theuwissen continues his report from ISSCC imaging session. The second part presents Forza and NHK 133MP 60fps sensor in 35mm FF format. 484 12b SAR ADCs support that high pixel rate. The pixel size is 2.45 um, 2×1 shared, 2.5T/pixel. Samsung presents an always on low power sensor having an ultra-low power, low resolution, low quality mode, but waking up as soon as there is any movement in the scene and switching to a normal higher resolution, higher quality mode. Business Wire: ON Semiconductor (Aptina) successfully demonstrated its second generation Phase Detect Auto Focus (PDAF) technology featuring a unique pixel micro-lens technology that enables fast focus at 25 Lux light levels. This PDAF has been implemented on a 13MP test chip with 1.1µm pixels and will be utilized in a new product introduction for mobile end-market customers later this year. The PDAF technology uses two pixels to measure phase information from the target image. This phase information is then used to calculate the direction and the amount the lens needs to move to focus in less than 0.3 seconds, depending on focus actuator speed. 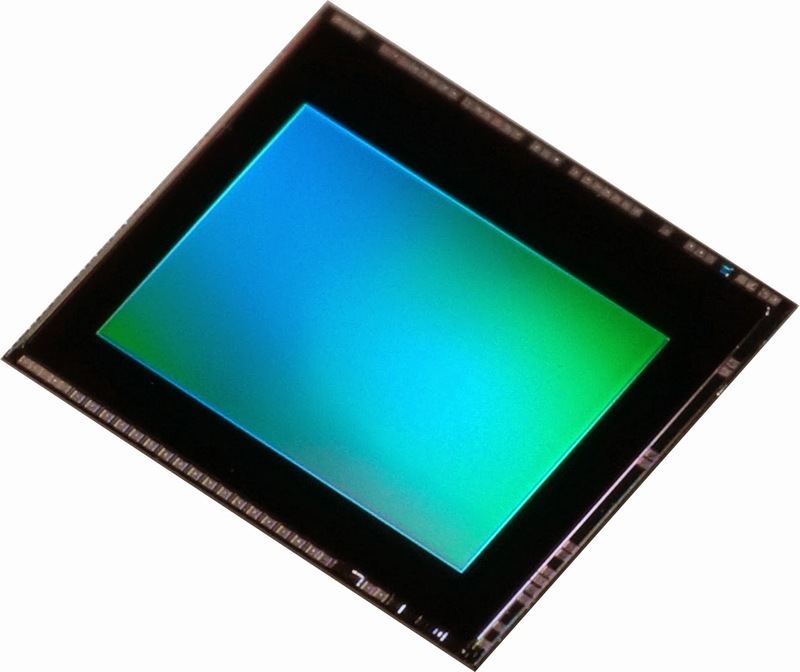 Furthermore, ON Semiconductor has implemented a unique pixel micro-lens structure which maintains sensitivity in the PDAF pixels and ensures enough light is captured for PDAF to perform in low-light conditions as low as 25 Lux (similar to a dimly lit room). Competing technologies on the market employ methods that compromise pixel sensitivity and low light auto focus performance. 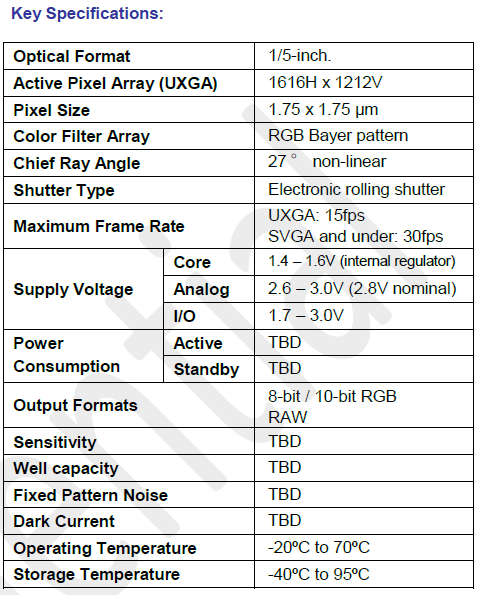 Business Wire: Toshiba started mass production of the previously announced 8MP, 1.12um pixel T4KA3 BSI sensor. The sensor has a new low power circuit design that cuts power consumption to 46% that of Toshiba’s previous generation 8MP T4K35, an improvement over the earlier announcement that only stated 15% improvement. The sensor fits into 6.5mm square camera module, said to be the smallest in the class of 8MP sensors. 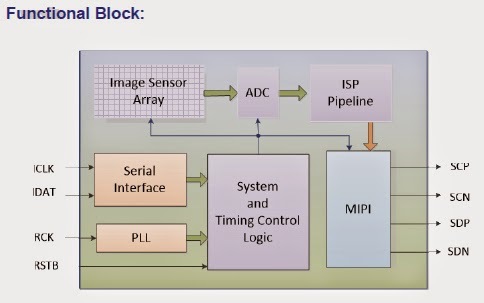 The 8MP output at 30fps is possible using 2 Lane MIPI interface. The sensor incorporates "Bright Mode" that boosts image brightness up to four times, realizing HD video capture at 240 fps equivalent. Allied Vision, vendor of machine vision cameras, confirms Sony plans to stop CCD production. Michael Cyros, Chief Commercial Officer of the company, says in an interview: "Many in the industry had expected this to happen sooner or later. As you know, CMOS sensors have become more and more popular in the last couple of years. 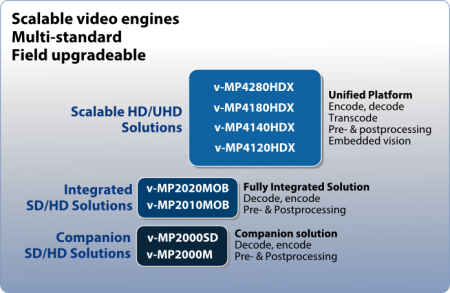 With greatly improved image quality, sensitivity, dynamic range and speeds, they have outpaced CCD technology of late. Sony’s decision is a logical step in that context to provide further capacity for CMOS growth." Thanks to PJ for quoting the link in comments to the earlier post. Optics.org publishes an article on AIT and Sharp development of a colorized IR-illuminated camera: "The technology performs the color processing based on the weak correlation between the reflectance properties in the visible light region of objects and those in the infrared region, and obtains color images of the objects in the same or similar colors as the colors of the objects in visible light." The AIT colorizing algorithms require a modification of image sensor in the camera, but article gives no details on what kind of modification is needed. PR Newswire: OmniVision and eyeSight announced their co-development of next-generation gesture recognition technology in the industry's smallest form factor. eyeSight's gesture recognition technology, together with OmniVision's OVM6211 global shutter camera solution brings gesture recognition to a wide range of applications. The OVM6211 CameraCubeChip is a complete camera solution with a lens, sensor and packaging that uses a 3um OmniPixel3-GS global shutter pixel to capture 400 x 400 pixel video at 120fps. "One of the frustrations with gesture recognition solutions in the market today is that they tend to work poorly in low light conditions," said Gideon Shmuel, CEO at eyeSight. "OmniVision's easily integrated OVM6211 global shutter sensor, working in tandem with our gesture recognition technology, can overcome the inherent challenges of recognizing gestures in difficult lighting conditions. This is critical for enhancing user experience and further broadening the scope of potential applications." Nine patents directed to a lens system. These address reduction of an entire length, correction of distortion, increase in viewing angle, high resolution power, securing similar optical performance with fewer lenses, and reduction of variation of resolution power in automatic zooming, etc. Six patents directed to the structure and driving mechanism of the lens module. These allow for the minimization of the size of an optical system, auto-focus or zooming module, cost-saving of materials, and facilitation of electrical connection, etc. Four patents directed to the sliding structure. These address compact size with less thickness, reduction of friction, increase in sliding stroke, user convenience, smooth sliding operation, and better readability of a key pad, etc. One software patent addresses improvement of user convenience in combining images for panorama image. Nikon's AF-S 300mm f4E is the long-awaited successor to the 14-year old 300mm f4D. It shares the same 300mm telephoto focal length and f4 aperture as its predecessor, but employs a completely different physical and optical design, with a considerably smaller and lighter body and the inclusion of Vibration reduction to counteract the wobbles. In his in-depth review, Thomas has thoroughly tested every aspect of the new lens, including making multiple comparisons with its well-respected predecessor. Find out if it lives up to expectations in his Nikon AF-S 300mm f4E review! 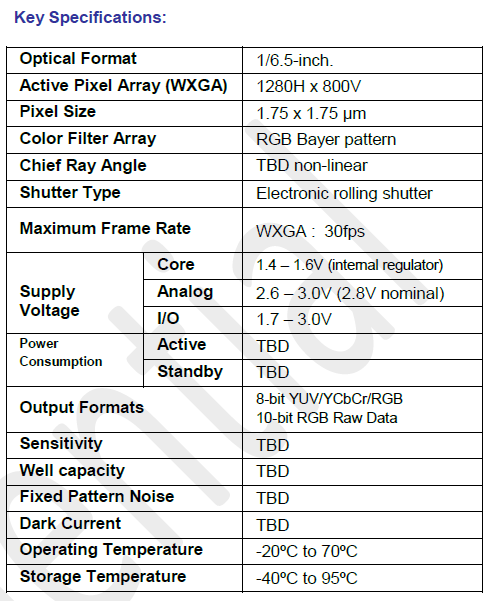 Sony to Discontinue CCD Products? This info originally appeared in a number of forums, such as this one, but it has no official confirmation. The info can be a hoax. This message is to inform that SONY decided to discontinue all their CCD image sensor products! Attached please find the official letters from SONY! Please note: for new designs, especially with CMOS sensors we can offer in-depth technical support and are able to provide reference designs etc to you under certain conditions. Especially we are already working on reference designs of the upcoming IMX25x-series. If there are any questions or any further need, please contact your FRAMOS account manager, or sales@framos.com as soon as possible!" Thanks to NA for the info! poLinght publishes its TLens brief datasheet. Videantis and Gestigon partner to team Videantis’s low-power vision processing IP platform with Gestigon’s tracking and gesture recognition. The main aim of the cooperation is to bring gesture and pose recognition technology to the automotive market, which is rapidly adopting a wide variety of vision-based technology. More and more image sensors are entering cars, including depth-sensing technologies. These sensors can be used for skeleton tracking inside and around the car. The driver and passenger’s poses, behavior, and signals can be used for “classical” gesture control but also for more advanced, UX-focused comfort and security features. 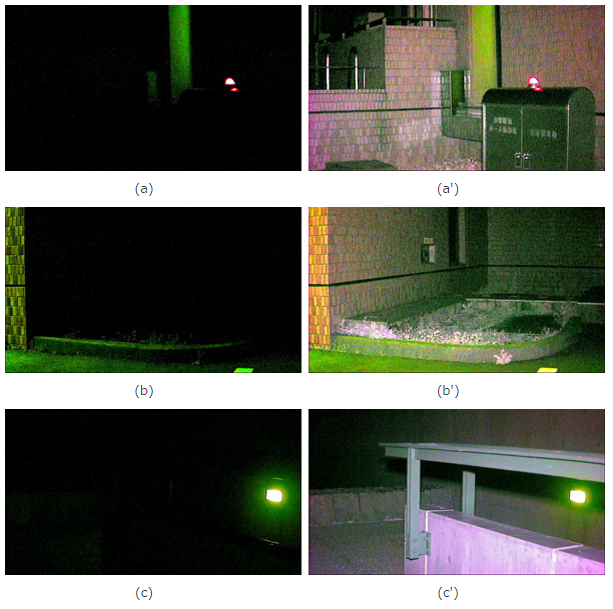 "Systems and methods are provided for improving image accuracy and/or perceptual quality by using supplemental data from sources external to an image sensor and/or a light sensor of an imaging device without requiring users to manually enter this data. The supplemental data, for example, may include lighting condition information retrieved from databases that provide general weather information, color temperature models, images in a similar environment, control setting information of those images, statistical information of those images, and/or any other information that may be used to improve the accuracy and/or perceptual quality of an image that was or will be captured. In some aspects, if the image has not yet been captured, the supplemental data may be used by the imaging device to adjust appropriate control settings (e.g., a color balance setting, a flash setting, an aperture setting, a shutter speed setting, an exposure compensation setting, an ISO setting, a light frequency setting, a noise reduction setting, a sharpening setting, etc.) such that the image can be captured accurately and/or with higher perceptual quality. In some aspects, if the image has already been captured, the supplemental data may be used to adjust the image itself so that it accurately reflects the environment in the image and/or improves the perceptual quality. ...environment identification module 202 may determine the environment using a global positioning system (GPS) sensor, a Wi-Fi-based positioning system (WPS) sensor, a gyroscopic sensor, an accelerometer, a magnetometer, and/or other sensors. One or more of these sensors may be part of imaging device 102." One could expect such kind of patents come from Apple, Broadcom is a surprising source for that. "In short, the grating produces an image blob on the sensor array that is meant for computers, not humans and unlike in a traditional camera, in our lensless smart sensor the image is computed using special algorithms. I’m particularly intrigued and encouraged by our most recent work on designing gratings and subsequent digital processing to address particular image sensing tasks such as image change detection, visual flow estimation, face detection, object tracking, people counting, and so on." "Several facts are clear, though: our resolution is lower than that typically discussed at Image Sensors—thousands or tens of thousands of effective pixels, not millions or billions. Moreover, because of our sensor small size, we do not collect much light compromising our low-light sensitivity. We are confident that there are many large application areas for our sensors, even given these constraints." Sony to Spin-Off Image Sensor Business? "Sony plans to make the department responsible for the Walkman brand a separate subsidiary in October. This would likely be followed by the spin-off of the device division including image sensors in the future, according to Kazuo Hirai, [Sony] chief executive." Update: EETimes too quotes FT article on the image sensor business spin-off. "We will spin off businesses that are currently run by the main body one by one," Hirai said. "(By leaving only departments related to management, R&D, etc to the main body), we will make small headquarters to increase the speed of making management strategies and decisions."